I found myself with an hour to kill on a particularly hot day so, instead of baking myself in my car reading, I decided to take a nearby detour to Burton Road – the heart of West Didsbury. Many moons ago in the 1990s I lived in nearby Withington and occasionally ventured up Burton Road to the swimming pool (not the best), Withington Hospital (never good) or the Nepalese restaurants (pretty good). Back then it was just another road on the edge of Didsbury which was on the way to The Woodstock and The Yewtree (now sadly closed) pubs on Barlow Moor Road. In recent times I’d heard things were happening along Burton Road and I’d been meaning to check it out. Getting to Burton Road is quite simple from Manchester city centre – head down Princess Parkway, take a left down Nell Lane, go to the end of the road and turn left. It’s slightly trickier from the motorway – you take the M60, take junction 4 which leads to the A5103/M56, then you take the first slip road you see to Northenden, take a right and a right again and you get back on the A5103 towards Manchester and take a right onto Nell Lane. 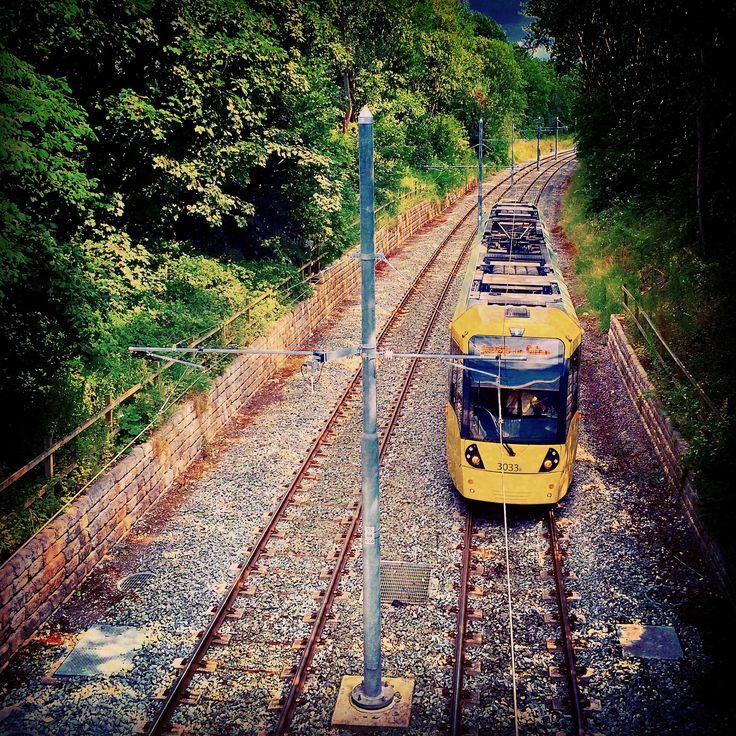 Alternatively, you can now get a tram here from the city centre – just jump off at the Burton Road stop. There is on-road parking in dedicated parking bays for up to 1 hour, although there are plenty of side streets to park in for longer. However parking is a premium here as it’s very built up with flats and shared accommodation. Burton Road itself is primarily a residential area full of large red brick Victorian houses, although modern flats have popped up all over the place. Between Burton Road and Princess Parkway there is a large private housing development called Didsbury Point built on the Withington Hospital site. There is also former council housing now run by Southway Housing off Burton Road, so you do really get a diverse demographic mix in West Didsbury. It was a Thursday afternoon and all was quiet along Burton Road. There were a few people hobbling along to the outpatients at Withington Community Hospital and some people were having drinks outside the various cafes and bars. 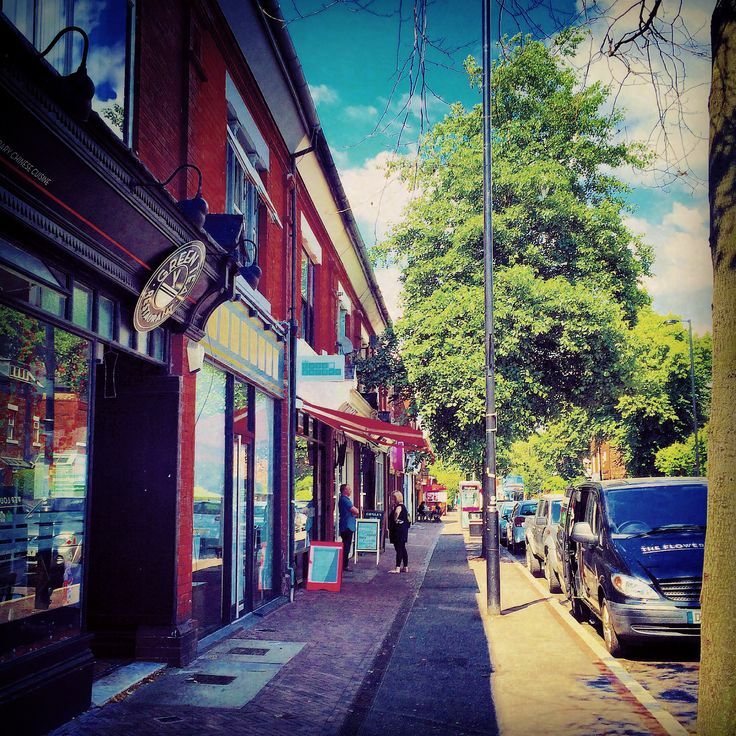 Burton Road is definitely a home to independent shops. If you wanted to a find a gift and a card for someone, you would not struggle to find something along here. There is a nice little vintage shop with a friendly assistant. As much as I like looking at vintage stuff I can only really buy accessories. The truth is I’m too big for all the nice vintage clothes. Recently I’ve been watching the Channel 4 programme “This Old Thing” and have been quite frustrated they haven’t mentioned at all that vintage sizes tend to be on the small side. So if you are above a size 14 you are essentially buggered unless you want to look like your Nan. Anyway, the shop had lots of pretty things to be bought. I enjoyed pinballing from shop to shop. You want kitchen stuff? You want some furniture? You want some artwork? You could find it all along here and Lapwing Lane. The place caters for all budgets and tastes, although it was laughable that some bloke was trying to pay for a £2 birthday card with a credit card. Who’s too posh to carry cash these days? The assistant told him there was a £5 minimum for card payments and there was a cash point across the road. It was good to see, despite all the gentrification, there were still some regular shops like discount stores, standard takeaways, newsagents and hairdressers. 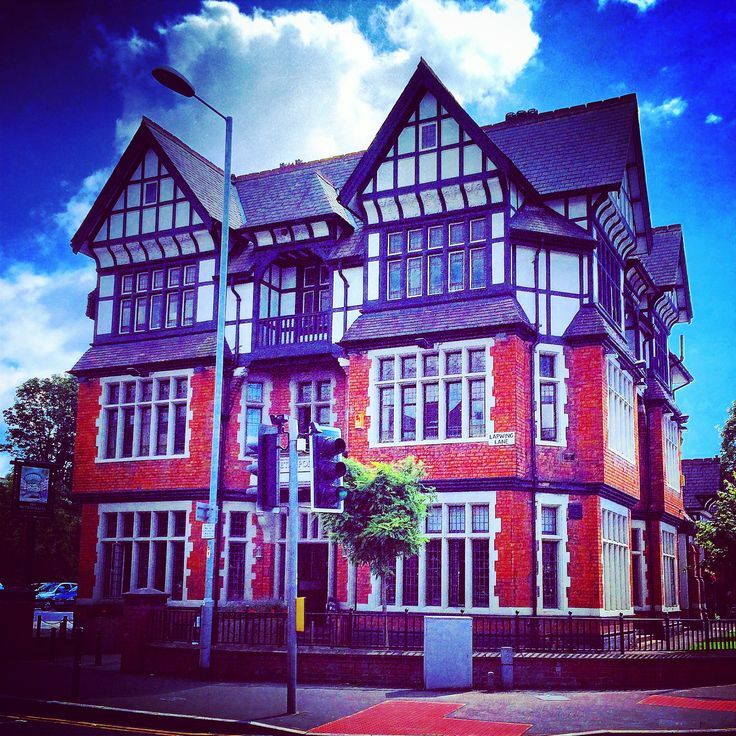 However there are no charity shops, but they are located in Didsbury Village and Withington. If you cross over the Metrolink bridge towards Withington it’s like how Burton Road used to be in the 1990s. I like places which are a mix of the new and the traditional. I hate it when places get to the point where you can’t get a pint of milk and a loaf of sliced bread, but can get some hand thrown pottery and some funky artwork. Thankfully West Didsbury hasn’t hit that point yet. 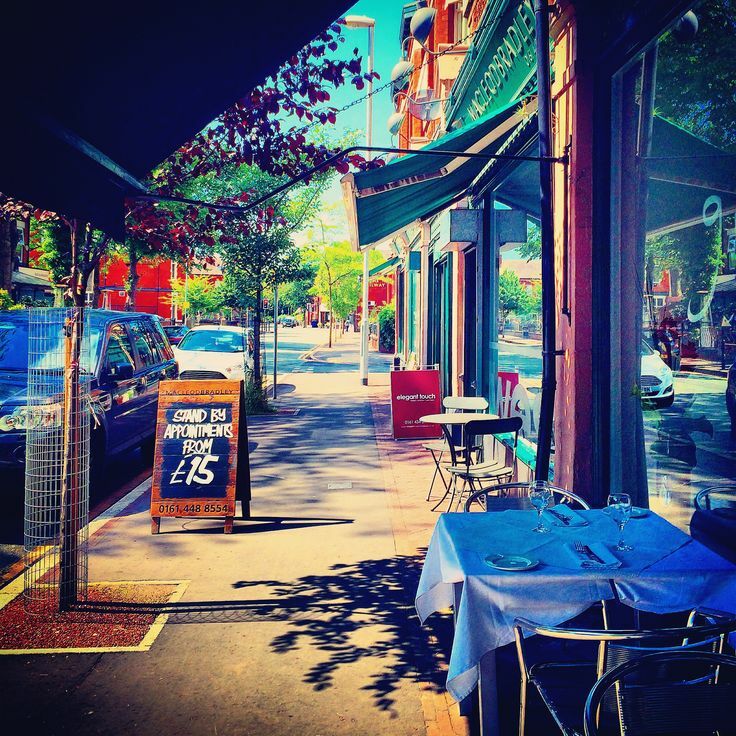 You don’t have to cook in West Didsbury and could easy eat out for at least a couple of weeks in cafes and restaurants without repeating yourself. Years ago I remember we had a fine meal at the Metropolitan restaurant pub on the corner of Burton Road and Lapwing Lane, so it was great to see it was still going strong. I also remember Neil going all experimental at the local Nepalese restaurants by ordering banana and lychee curry. Actually there are three Nepalese restaurants along here which is really unusual, although if memory serves me correctly the Gurkha Grill was the original one. You are truly spoilt for choice here from budget to high end dining – Thai, tapas, vegetarian, Japanese and even English high tea. What I did notice and maybe this was due to the fine weather, but there was a French café culture vibe going on. From the little cafes to posh restaurants you could eat and drink outside whilst watching the world go by. Often in Manchester alfresco dining is more an endurance activity, but in fine weather I almost feel transported back to Paris. Along with the restaurants there are plenty of bars and pubs, many of which also serve food. You could see by the customers there is a youthful vibe in this part of Manchester. The pub which intrigued me most was The Railway on Lapwing Lane. It’s part of the Holt’s pub chain, which is known for cheap beer and often attracts the older, overly committed drinkers. However this place didn’t look like your standard Holt’s pub, as it had stealthily blended itself into surroundings by being faithful to its Victorian origins and going a bit neutral with its decor. I could see myself having a drink here with friends having a nice chat. Weirdly, while googling the pub, I found out Johnny Depp has been known to frequent this place. Burton Road does scrub up well. I can imagine this is a lively neighbourhood in the evenings and now with the Metrolink on the doorstep I’m sure we’ll be taking a trip one evening to sample its delights. Honestly I could not have imagined it would change so much in 16 years. It’s understandable this place is popular with students and young professionals. Whilst I’m certain the rents are high and the house prices are silly, it’s a vibrant neighbourhood with good transport links and I can understand the appeal.